The new Ovator S-800, Naim’s new flagship loudspeaker, draws on five years of research into Naim’s Balanced Mode Radiator (Naim BMR) and introduces Naim’s radical flat-panel bass unit, designed to deliver a sound quality more consistent with the Naim BMR and which removes the cavity effect, a problem with conventional bass units. August 10, 2012. Hong Kong High-End Audio Visual Show. Paul Stephenson, Naim Audio’s managing director, today launches the Naim Ovator S-800 loudspeaker and will be personally demonstrating the speaker in its active configuration during the Hong Kong Show. The S-800 is an imposing loudspeaker designed for the owner with a larger than average room and one who appreciates music played with a natural sense of scale and dynamics. That does not necessarily mean playing music at a high level; it’s more about enjoying the natural sounding dynamic range of good music recordings without feeling the loudspeaker is holding things back. Of course if an owner wishes to play Wagner’s Ring at front row of the concert hall levels or ZZ Top at live rock levels the S-800 will simply sing and deliver every nuance, every note, from the quietest to the loudest, without effort. The Ovator S-800 will be available in active configuration from December 2012. Active is when each drive unit is connected to a different amplifier and the crossover is electronic and between the power amplifiers and the pre amplifier. This delivers the finest performance. In passive form, with a crossover built into the die-cast aluminium plinth, the speaker can be used connected to one amplifier. This will be available in January. Customers often start with the passive version and then upgrade to an active system later. 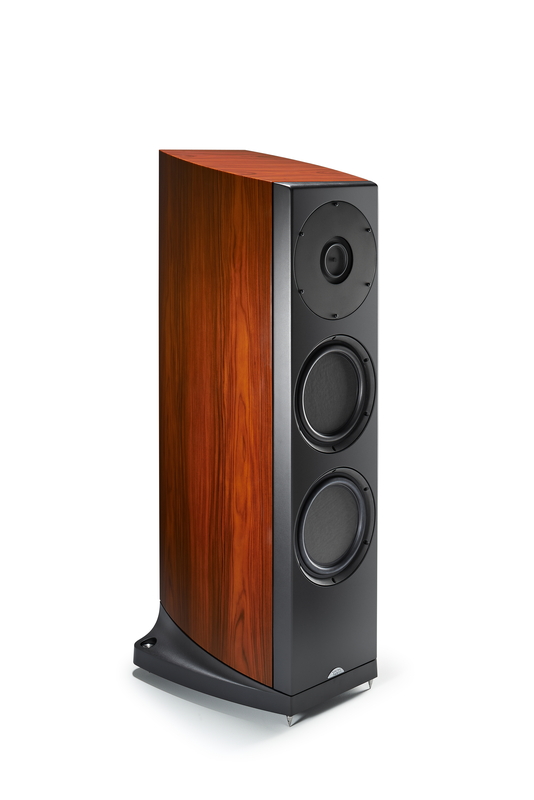 There are many key innovations hidden within the S-800’s elegant loudspeaker cabinet. A new 82 mm Naim BMR including all of the techniques learnt from five years of research and development. The Naim BMR drive unit delivers a flat frequency response from around 380Hz up to over 30kHz with wide even dispersion over this whole range. A traditional loudspeaker would require a mid-range and a separate high-frequency unit (tweeter) to do this and this introduces two problems not found with a Naim BMR: The conventional design introduces a need for a crossover circuit right in the middle of the area where hearing is most sensitive and it also has quite large variances in sound dispersion depending on frequency. Traditionally bass drivers have had coned shaped diaphragms as it is far easier to make them rigid; a prerequisite for a bass cone, however the flat diaphragm bass unit is the ideal for a bass driver, as it doesn’t suffer from the cavity effect. Materials technology and computer science in the forms of Finite Element Analysis and Laser Interferometry have allowed the Naim team to develop flat drivers that truly perform. The cone material is created by bonding together two 6mm-thick sandwich panels with paper skins and an aluminium honeycomb core. The Naim flat diaphragm bass drivers are capable of a massive linear excursion of 20mm with low distortion and consequently can deliver thundering, extraordinarily clean, bass lines if required to do so. Both drive unit chassis are custom-designed high-pressure-die-castings again modelled using Finite Element Analysis to optimise their performance. The bass driver chassis, for example, has a triangulated structure that provides great rigidity while also maximising the open area behind the cone improving linearity. The loudspeaker walls are constructed of nine constrained layer damped layers of MDF bonded under heat and pressure and formed into a curve that contributes significantly to the overall structural performance. The rigid high-pressure aluminium die-cast plinth gives the S-800 substantial base and includes and innovative leaf spring system to isolate the speaker from the floor. Especially useful in rooms with suspended floors. The Naim BMR is mounted in a 12.7 mm wall thickness cylinder enclosure that is suspended within the main enclosure by twin circular plate duralumin leaf-springs – one at the front of the enclosure and one at the rear. The cylinder, extending the full depth of the enclosure, is gradient-filled with damping materials selected through technical analysis and critical listening. The suspension system decouples above 4Hz – more than six octaves below the Naim BMR pass-band. The difference this makes to the performance cannot be overstated. The isolation of drive unit from cabinet and cabinet to drive unit brings a cleanliness of sound delivery that has to be heard to be believed. The new Naim Ovator S-800 represents a significant step forward in Naim BMR drive unit design combined with two large (280mm) innovative flat-panel bass drive units. This combined with a heavy, rigid and inert cabinet construction; enable the S-800 to deliver a musical performance the cuts deep to the artistry and emotion of the performers.